Although this will take some extra work, it’ll be worth it once you see how charmed your guests are by your cute pet. Best to work with your awesome wedding planner to pull this off. But for now, we’re rounded up adorable ways on how you can incorporate your favorite animal into your wedding to make it a furry-tale-perfect celebration. What’s the best way to get a sweet YES from your partner? Propose with a loveable accomplice! You can have a personalized “Will you marry me?” tag for your dog (or cat) or a collar with a diamond ring pendant. You can also get creative by giving a puppy instead of a ring – now that’s truly heart-melting! Instead of a boring and predictable save-the-date sheet of paper, use a photo of your pet to announce your big day. It can be a funny and candid shot or a staged and stylish one. Don’t forget to dress your cuddly buddy for the part! Add fun and personality to your pre-wedding shoot by including your fur babies! Dress them up in line with the theme or have a casual and comfy session at home. If you have pet birds, fill the venue with their sweet songs by incorporating them into your décor. An elegant birdcage with a pair of lovebirds will surely make the wedding more romantic. You can also take inspiration from a wedding tradition from the Philippines wherein they use doves as a symbol of a long and peaceful married life. Who should carry the ring? The cutest member of the family, of course! If your pet is well-trained, have him walk down the aisle for an aww-inducing moment. If you’re not that confident, have a member of the entourage walk with him. Don’t forget the bow tie! Dog and cat figurines? Pet-shaped cookies? Stuffed toys? The possibilities are endless! Use your pets as inspiration for your wedding favors. Have a one-of-a-kind wedding topper by using a photo or including a figure of your pet as a cake topper. Have it 3D printed depending on the color and size that you prefer. Then take home as a souvenir from your big day! 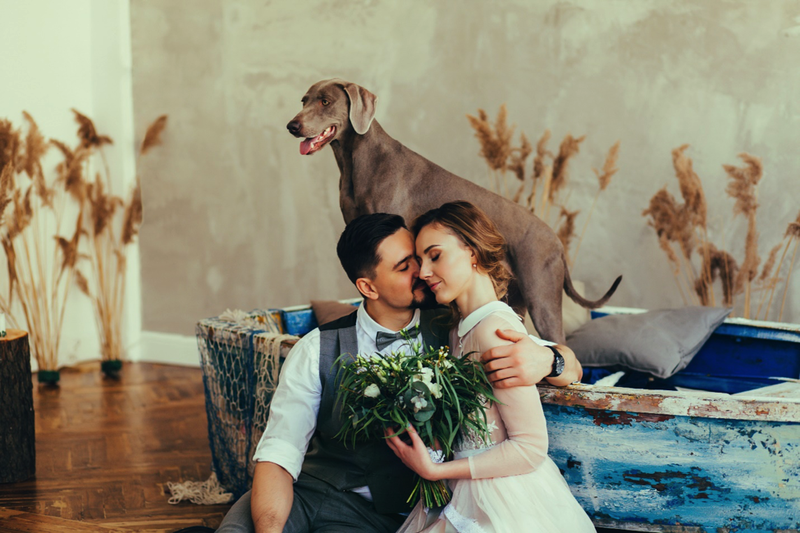 Before you go ahead and grab your pets, remember that there are considerations when incorporating these adorable creatures not just in weddings but to any event. First is to make sure that your venue allows animals, as most indoor venues don’t. If you’re really intent to involve your furry friend, an outdoor celebration would be most ideal. Make sure that your pet is also in good condition and is not prone to stress when exposed to a big crowd, this is to make sure the wedding will be smooth and trouble-free. If you have a budget to spare, hiring a pet sitter is recommended. Let your guests know that the wedding will involve animals, as a precaution to those with allergies. Lastly, remember that your pet is not a prop, and should be taken care of before, during, and after the event. She is based in Athens but travels a lot. Her business motto is "Tailor Made Happiness". She is in love with beautiful minds, attracted by Greek light and Inspired by architecture. Passionate about adding beauty and style to some of life's most important moments, she likes to think of her work as creative art, the art of Making Happy Memories.